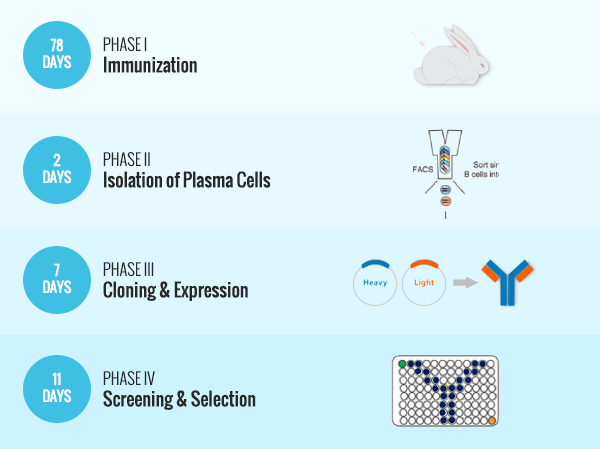 Pacific Immunology and ExonBio offer custom Rabbit Monoclonal Antibody development services using SPIN® (Single Plasma Cell Interrogation) Technology. This proprietary technology screens the immune repertoire of rabbits, creating the power to select epitope-specific antibodies directly from affinity matured plasma cells. High affinity: Only high affinity antibodies will be selected due to the isolation of the terminal differentiated plasma cells. Broad spectrum of epitope coverage: We take advantage of the unique properties of the rabbit immune system to obtain antibodies against a broad spectrum of epitopes for a single antigen. Recombinant antibodies ensure the preservation of genetic information. The customer will receive both monoclonal and polyclonal end products. Rabbits are well-known for mounting a strong immune response against foreign antigens and rabbit polyclonal antibodies are among the first established and most widely used research tools in immunology. In terms of affinity and specificity, rabbits produce superior antibodies against many antigens in comparison to rodents. Antibody affinity is typically represented by the equilibrium dissociation constant (KD), a ratio of koff/kon between the antibody and its antigen. While most mouse monoclonal monoclonal antibodies have a KD value in the nanomolar range (KD = 10-9 M), rabbit monoclonals consistently demonstrate Kd values that can reach the picomolar level (KD = 10-12 M). In an immunoassay, a high affinity means that you can use less antibody under more stringent conditions without a corresponding loss of signal strength, therefore ensuring the highest sensitivity with the highest possible specificity. The lower immune dominance, extensive somatic gene conversion, and hypermutation that characterize the rabbit immune response results in more diverse epitope recognition. Thus, the rabbit immune system will yield a wider range of antibodies that recognize more unique epitopes. Rabbits have a unique immune system that allows them to develop antibodies against small moieties in small molecules, lipids, and polymers, as well as subtle changes in epitopes such as post-translational modifications or single amino acid substitutions. The ability of rabbit antibodies to recognize and mount an immune response to these small differences is confirmed by the large numbers of antibodies that target post-translational modifications such as phosphorylation, methylation and acetylation. B cell development and repertoire diversification vary significantly among species. Diversification of the Immunoglobulin (Ig) repertoire occurs through the combinatorial joining of multiple V (for “variable”), D (divergent), and J (joining) gene segments for the Ig heavy and light chains through VDJ Rearrangement, followed by somatic mutagenesis upon subsequent exposure of the B-cells to a foreign antigen (Somatic Hypermutation). The rabbit IgH repertoire displays highly restricted VH gene segment usage, in comparison to humans and mice, which use a diverse assortment of germline VH gene segments during VDJ rearrangement of the heavy chain. The rabbit and chicken immune systems generate antibody diversity and optimize affinity by mechanisms that are more efficient than those of mice and other rodents. Besides the common Somatic Hypermutation, Rabbit and chicken B cells also employ a mechanism called Gene Conversion, which involves the non-reciprocal homologous recombination of upstream pseudo V gene loci into the recombined VDJ (and VJ) locus. This gene conversion uses approximately 300 pseudo V-genes to dramatically enhance the diversity of the rabbit antibody repertoire and increase the probability of generating functional antibody clones. The success of single memory cell based monoclonal antibody technology used in generating HIV neutralization antibodies, inspired us to develop a single plasma cell based approach to develop monoclonal antibodies. Plasma cells and memory cells are the two types of terminally differentiated cells harboring fully matured antibody clones. For both humans and mice, there are already known cell surface markers available for memory cells and plasma cells. However, isolating plasma cells from other common (and superior) antibody generating animals, such as rabbit, chicken, and llama, required that we develop a patented novel approach that is capable of isolating plasma cells from these species with high accuracy. The rabbit immune system generates broader antibodies with higher affinities. Current hybridoma technology and phage display technology can’t effectively screen for the best antibodies from the large number of low affinity or non-specific clones. Our new Single Plasma Cell Interrogation (SPIN®) technology can retrieve the rare and superior clones from among millions of B cell clones.